The event will feature a cocktail reception, silent auction, premier dinner, keynote speaker, and plenty of dance floor opportunities at one of Chicago’s most exclusive hotels. Dress is business or business casual. Cocktails from 6-7, program and dinner from 7-8, dancing from 8 until 11! 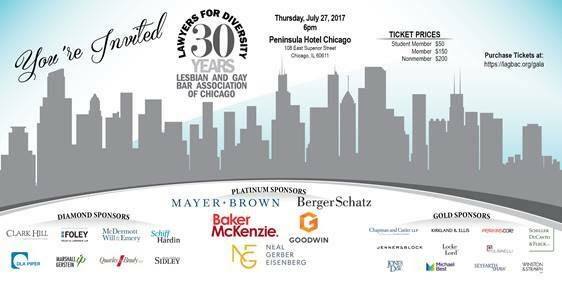 LAGBAC’s 30th Anniversary Lawyer’s For Diversity Gala taking place on Thursday, July 27th at the Peninsula Hotel. Proceeds from the Gala provide vital support for law students pursuing opportunities with non-profit organizations such as Lambda Legal, Equality Illinois, Heartland Alliance/the National Immigrant Justice Center and many other public service organizations that are doing important and needed work in the LGBTQ+ community. All proceeds benefit the LAGBAC Foundation, a 501(c)(3) organization, and tickets/donations are tax deductible to the extent provided by law. If you have questions, please contact gala@lagbac.org.